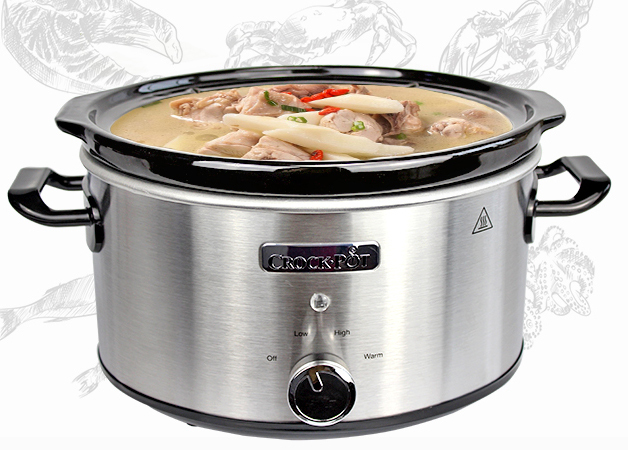 We have all benefited from using the crockpot to create healthy and delicious meals. It has helped me on several occasions to cook a delicious meal by just preparing the ingredients earlier on. The crockpot will also tenderize the meat. These pots will be of service when you have other things to attend to. What makes it even more appealing is the fact that you can cook different dishes on the single pot at a go thus reducing the time you would take to cook one dish after another. You will have layers of flavor in each meal you prepare. But for it to work effectively you need to follow a guide and the books below will show you how to use it to your advantage. It’s true to say that the world we live in today moves so fast. Sometimes it’s even tricky to make a meal like we used to traditionally. This has seen the rise of fast food in the market. Unfortunately, fast foods aren’t healthy and are causing many diseases across the globe. This is why most nutritionists have discouraged the use of fast food instead people are encouraged to use healthy cooking methods like the crockpot. Emma, through her book, teaches her readers that it’s possible to have a rich and healthy meal regardless of their tight schedule. In reading this book, you will discover that a crockpot not only saves your time but also money. It features 1001 recipes that are designed to suit both the experts and beginners in the field of slow cooking. You don’t need to boil, simmer, roast or blanch on the stove top. You only need to prepare your ingredients then place them in the crockpot and let it finish the hard part for you. With the 1001 recipes, you have a recipe to try for up to 3 years. The author begins by highlighting to you why the crockpot may be the most important item you need in the kitchen. Note that, you don’t need to be a professional to cook using this item neither do you need to understand it. You only need to want to benefit from it. Once you buy the crockpot, buy yourself the crockpot recipe book and enjoy the 52 out of the ordinary recipes that utilize your regular ingredients. From appetizers to main meal and desserts the book finds the best recipes yet the easiest to cook. We all like to wow our guests, right? This book will make you enjoy your meal while making your guest wonder at your expert skills in the kitchen. Here is another most loved crockpot book that allows you to enjoy up to 100 recipes to cook in your slow cooker. You can use it to get ideas of making appetizers, main meal, dessert or other sweet tooth delicacies. You also won’t have to peruse through the book in search of the correct recipe because they are arranged by meal type and occasion. Use the recipes to cook your dinner in a few minutes. Note that, you can prepare the ingredients in the morning, go about your day and come to eat your dinner later. 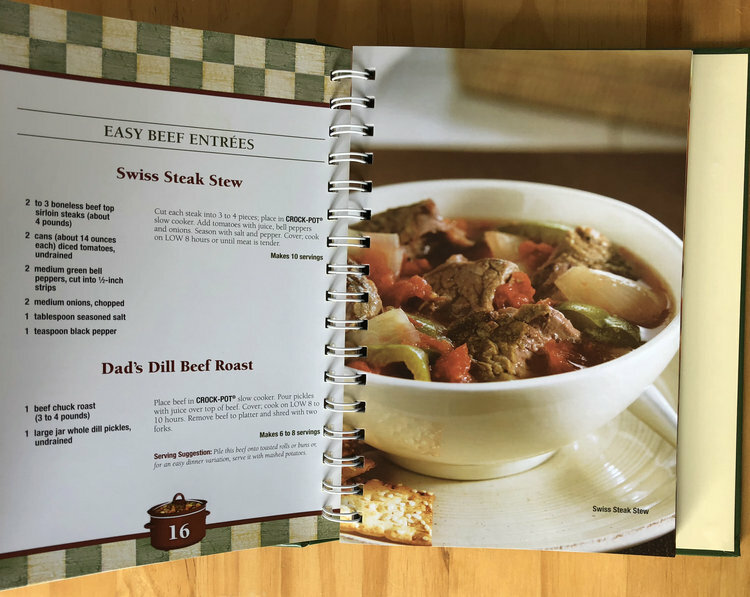 When it’s winter let your crockpot make you some meals to keep you warm using the recipe book. The book teaches you how the slow cooker blends various subtle flavors to give you a delicious meal. Aside from the different world class recipes, the book gives you tips and techniques to use in creating a dish with great flavors. It’s designed to make cooking easy by giving you the step by step instruction to follow in order to make a delicious meal. You probably know Phyllis Good as the lady who has created thousands of recipes during her cooking career. She is a master in the slow cooking method and in this book, she brings together 100 essential, innovative and simple recipes. She further gives you 200 variations for you to customize them according to your needs. Whether you want your vegetarian choices, paleo diet or slow cooker crème Brule you have a display to choose from. I like this book because it makes it easy to use the slow cooker as well. You can utilize the simple hacks while making two different recipes at once. You will simplify the cooking process by spending lesser time in the kitchen to prepare the rich and delicious meals. To create this book, Good utilized the use of crowdsourcing information. The best-voted recipes were only improved and placed in the book. I’m sure you will find this book interesting. Each of us loves the taste of a richly flavored meal in the evening but you can’t have that if you have a busy day and don’t have time to cook. This book gives you recipes that are easy to make yet healthy, delicious and dump meals. One thing that is appealing with the book is that it teaches you the recipes to cook when you dump, scurry them off and then come back to a well-cooked meal. This book contains the right ingredients to use in cooking the meal, the amount of time to cook it and the serving to take. Also, it gives you the step by step instructions on how to make the recipe. Remember that your slow cooker encourages you to cook healthier meals while reducing your calorie intake. You will realize that you have never found such an easy to read and understand the book. With the 100 recipes, you have no reason to eat unhealthy fast food rather enjoy the easy to cook meals in the comfort of your home. It’s not easy to eat your meals and remain healthy when all you have to do all the time is the budget the time to prepare the recipe. In such instances, you will have to compromise on the quality of your food or the nutrients you consume. Shannon who was a victim of limited time came up with recipes to suit herself and all others caught in the same scenario. She developed easy and healthy recipes that she can use in her slow cooker. The easy healthy slow cooker is yours if a busy schedule describes your days. All the recipes are made for you to enjoy eating anyways yet not fuss about where to get the different ingredients. The book has 125 low-calorie recipes that you can cook at any time of your day. Who said that slow cookers must always take hours to cook? You have recipes that will take minutes to prepare thus minimizing the effort. Lastly, you have tips on how you can adapt your recipes to the slow cooker that you have. Take time to get your quick fixes with this book. The invention of this whole30 came up in the year 2009 and it has since changed people’s eating style. Today Martha has made it easier by creating the recipes so that even those who can’t partake in the process can enjoy the wholesome recipes. The slow cooker turns the recipes into hearty and your all-time delicious meals. This best-selling book is designed to get you out of the kitchen fast so that you can attend to important matters at hand. You will have the no-fuss dinners as you work on your projects. You will have the satisfaction of a one pot meal which makes the preparation and clean up a breeze. The ingredients you use for the preparation process are readily accessible in the supermarkets and grocery stores. They mostly only utilize the whole ingredients in the grocery stores thus making your meal a wholesome meal. The recipes work with an instant pressure cooker too. Here is another best seller on Amazon. The fix it and forget it is your ideal book if you like to explore the different recipes. This book is loaded with thousands of delicious and easy to prepare recipes. As earlier stated, Good has had a history of making slow cooking recipes to suit those with a busy schedule. I’m sure with the thousands of recipes you can get one that suits your requirements. It contains the many recipes that suit both the small and large slow cookers. If you think the book will get you bored, think again. The book has bright photos for the cooking or meal illustrations. If you only wish to get something simple, then the book helps you to make the recipes with only 5 ingredients. On the downside, most of the recipes call for you to use canned food as ingredients which may sometimes compromise on the quality. It’s a big cookbook but worth every penny. You will especially find it manageable if you don’t like hanging around the kitchen. It’s also ideal if you have limited time to cook. These recipes are created to suit the westerners no wonder it has become New York Times best seller. Phyllis has sold over 11 million copies of this book. If all you want is a book that can help both the beginners and experts in cooking this book is for you. It looks ordinary but it’s not, it has the information that is vital for a beginner in slow cooking. It teaches you the basics that you need to learn before you begin the cooking. The recipes are designed with health consciousness in mind. They are further easy to prepare, tasty and delicious. You don’t have to know how it’s done because you have a step by step guide which will make the cooking process faster. You have the ingredients list clearly shown and the measurements you need for each recipe given to avoid guesswork. You won’t have to peruse through the whole book for you to cook. When looking for a recipe, you have a clear table of contents. Nancy has made sure that you don’t have to figure things out. She gives you every minuscular detail making the book the easiest to use in the market. With that said, the ball is on your court go out there and buy yourself this gift so that you can start enjoying the healthy meals. Here is a book for those who want to eat healthier at home. It helps you in utilizing your cheaper cuts of meat while you don’t have to stay in the kitchen for long hours after many hours at work. You only need the chosen ingredients, place them in the slow cooker, turn the cooker on and let it cook as you go about your day. It’s that simple. I know that you also wish to only eat healthily. Right? Sarah’s book takes your regular recipes and turns them into your favorite, tasty and delicious meals but most importantly she gives them a healthy twist. You can create your delicious meals with minimum to no effort at all. So, you recently decided to go meat-free and now the question is what to eat. Most people think that being a vegetarian include taking a boring meal but that’s not usually the case. If you will do your research you will enjoy your meals every single day. Buy yourself the easy vegetarian slow cooker cookbook and travel across the world of great vegetarian meals. You don’t have time to make the meals? Chop your ingredients and place them in the slow cooker and go your way. That should take you only 15 minutes. You have about 75 of the 125 recipes being vegan. If you are concerned about the calories in the meal, don’t you worry this book indicates the number of calories you consume per serving of each recipe. The nutritional information is clear. You don’t have to suffer in search of ideal meals just because the world has a larger population of non-vegetarian. Go about your day and let the Easy vegetarian slow cooker think for you. For all of us who love those slow cooking meals because they give you nothing less than healthy options, here is a book for you. This book will give you an array of meals without using the canned soups for flavor. Robin’s book is a proof that you don’t only need the slow cooker for inexpensive and tough cuts of meat. You can have very many other vegetarian and healthy cooking because you can prepare beans, grains and other kinds of veggies. This book segregates the different parts of your day to day meals. You have appetizers, soups, stews, veggies, breakfast, desserts and condiments. It further gives you an introduction to the slow cooking model and accessories you need to make the cooking easy. You all know how convenient a slow cooker is because, on all those tough days, the last thing you need is to have to spend more hours in the kitchen. With this book, the vegetarians and all those looking for healthy options can benefit from the healthy meal options. Martha Stewart is an expert in slow cooking that has taken her time to find out how people can utilize this amazing kitchen appliance. Her kitchen staffs spend the time to produce top-notch recipes that are easy to use by everyone at home. This book is mostly focused on making your regular recipes in the slow cooker. It also has topics on how to make it perfect even when you are using this tool. The 110 recipes are meant to utilize all the accessories in the kitchen. I like that it utilizes the hands-off cooking method while still unveiling the hidden secrets to producing a great meal. With this book you won’t only braise your meat cuts but also let it cook tenderly, it will make the soup and stews rich not to mention the gently poached fish. Mind you, you can bake the cheesecake in this slow cooker. You have everything in this book to make your meal a flavorful one while you attend to other businesses. You also have every reason to allow your meals to dazzle on the table even if you have busy days. For those of you with small families here is a great book for you to use in slow cooking. The good news is that all the recipes here are based on vegan recipes. While the cookbook is geared towards the need to slow cook in a small pot of 1.5 quartz, you will be surprised at the varying choices you have. What’s more, you will find endless lists of meals to eat while not needing a lot less effort to make them. Within this book, you will find an array of recipes that you have no choice but to fall in love with. From breakfast to snacks and to the dinner you will be surprised at how effective your little gadget is. Welcome home to the delicious and home-cooked meals. Southernliving cookbook is your ideal partner if you love the slow cooker. The 200 recipes you find in the book are well tested which means you aren’t taking on the guesswork. The cookbook is made of recipes that are best used by the whole family. It’s made by the most trusted authority in the country. It features 80 colorful pages that will tempt you to try cooking. They give you the easy to follow directions as well as tips of southernliving cooking. This makes the cooking process way easier. It has special chapters that feature holiday cooking, menu suggestion, healthy recipes. So, if all you are looking for is versatility and dependability this book is yours for the asking. In all essence, you have no reason not to make great tasting meals. This is a cookbook created by a great food blogger called Gina. With this book, you will make a meal that is nutritious and flavor-packed at any time of the day or night. She creates 140 recipes that will leave you leaking your fingers. If you know the skinnytaste cookbooks it’s not about the ones cooked in a slow cooker, stovetop or electricity. She has created great tasting meals that are the healthier options and as good as your original versions. The book has bright photos with easy pages to go through. For most people, these recipes are the best to choose. I enjoy slow cooking because one thing is true that I have a busy schedule through the week, month and days. Discovering the slow cooking method was my savior when all I could eat on a daily basis was fast food. For me the Fix-It and Forget-It Big Cookbook: 1400 Best Slow Cooker Recipes! came in handy and I have never regretted buying it. It really helped me enhance my cooking skills and I still use it. I am sure if you buy it, you will enjoy using it.